Bill Gold, the 92-year-old movie poster designer who created iconic ads for A Clockwork Orange, Alien, and The Exorcist, gave a fascinating interview to UnBeige, the design blog, recently.He revealed that one of his original drafts for the 1942 Humphrey Bogart movie Casablanca left out a crucial detail. Without this detail, the movie poster makes no sense at all. Casablanca is probably the best movie ever made, and it was advertised with one of the most memorable classic painted posters created by Hollywood. 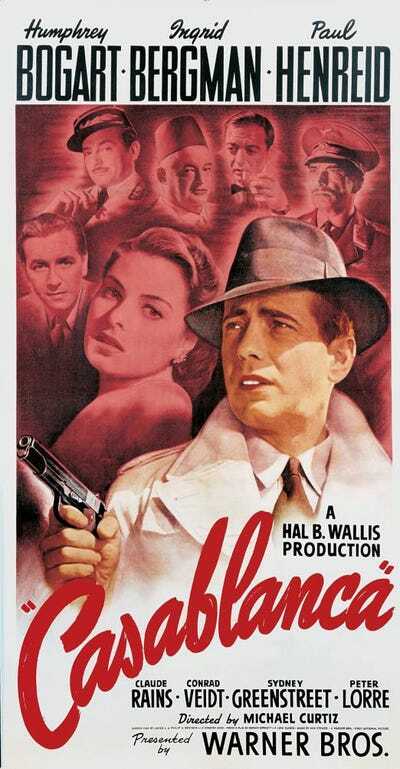 It depicts Bogart in the final scene of the movie, wearing a white raincoat and a wide-brimmed fedora. Receding behind him in the poster, in ochre shadows, are the other stars of the movie, including Ingrid Bergman, Sydney Greenstreet, Rains and Peter Lorre. The plot of Casablanca is so complicated, however — it’s a wartime romance in which Bogart and the Nazis both pursue a set of valuable visa papers and the resistance leader who needs them to leave the country — that it’s impossible to convey the gist of it in a single, still image. This was one of my first posters. My initial thoughts were to put together a montage showing all the characters depicted in the film. They appeared to be an interesting ensemble of notable characters. Something was missing, however. And I was asked to add some more ‘excitement’ to the scene. I added the gun in Bogart’s hand, and the poster suddenly came alive with intrigue. As is now obvious, the gun is the focal point of the entire ad, and the only part of the ad not covered in partial shadow. advertising advertising-us madison avenue warner bros.